This morning, after stopping at my Basha’s (see my Yelp! review) I was looking at my receipt. I was happily surprised to see that when you bring your own bags or basket to take your groceries home, Basha’s gives you a little “bag rebate” of 5 cents. Good for the environment and good business too! HEY! THANKS FOR THE HAAAAAAAAAAAAAYYY!!! 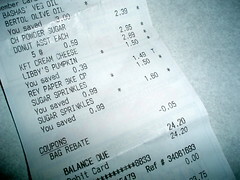 Do know what I love more than saving $0.5 at the grocery store? When people start blog posts with HEY! HAAAAAAAAY! He!